Lock in a great price for Bodnant Guest House – rated 9.6 by recent guests! The room was very comfortable & the staff were very attentive & friendly. The breakfast was well prepared with plenty of choice & there were no problems with them catering for my dairy free diet. The bed was very comfortable, good seating area in the room. The breakfasts were nicely cooked and tasty with plenty of choices. Friendly staff, well equipped and comfortable rooms, delicious breakfast. Friendly, professional, hospitable, very clean and comfy. Home from home. Food exceptional homemade cake in the afternoon and biscuits in your room with freshly ground coffee. The breakfast was the best I’ve ever had. 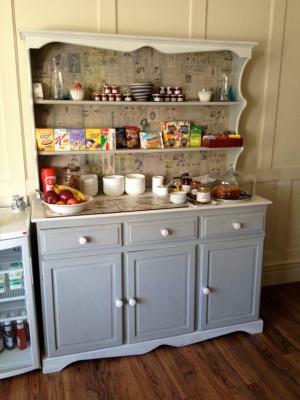 Choice of food cereal or yogurt, fresh fruit and homemade granola for breakfast followed by a cooked breakfast with vegetarian choices or a cooked breakfast special. Eggs benedict was sublime! Parking free and easy on the roadside in August. A communal fridge you can use to store milk and wine is very handy. Plenty to do in Llandudno a short walk to shops (5mins) and front promenade (15 mins). Plenty of great restaurants in the area. The accommodation was perfect, the owners had literally thought of everything. It is all those extra little touches that make the stay special and we could not have been happier. The breakfast was excellent and the service was great. The beds were very comfortable, the pillows were fluffy and the bedding was fresh,crisp and clean. The view from Room 2 was lovely looking out towards the Great Orme. The hosts were helpful, friendly and informative. I will definitely be recommending the Bodnant and will most certainly stay here again in future. It’s was a very comfortable nights stay, would like to have stayed longer. Comfortable bed, lovely decor, nice white bedding and towels. Quiet, superb breakfast, with fresh berries, yoghurt and the best home made granola, and veggie sausage. Lots of little extras, made an overnight stay very enjoyable. Very clean and comfortable, very friendly hosts, good selection of lovely breakfast foods and teas. Nice extras like sweets and good biscuits in the room, even homemade cake on arrival. Excellent central location, very homely. A 4-minute walk from Llandudno Train Station, Bodnant Guest House offers stylish rooms with free parking and WiFi. This North Wales guest house is a 6-minute drive from Great Orme Country Park with easy access to Snowdonia. Each room has a flat-screen TV, alarm clock and tea and coffee facilities. Rooms have an en suite or private bathroom with a hairdryer and toiletries provided. A cooked breakfast is served daily, along with yogurt, cereals, toast, tea and coffee. Bodnant Guest House is around 5 minutes’ walk from the seafront and its shops, with the Great Orme Tramway also nearby. Conwy Castle is less than 10 minutes’ drive from Llandudno, with the Welsh Mountain Zoo in Colwyn Bay around 6 miles away. When would you like to stay at Bodnant Guest House? These first-floor rooms are individually decorated and feature free WiFi. Some have Victorian brass bedsteads. This first-floor room is set at the back of the house and includes an en suite shower room. This first-floor room is set at the front of the house and has contemporary furniture. It has free WiFi and an en suite shower room. This second-floor room is set at the front of the house. It has a private bathroom located outside the room, including a bath and bathrobe. Please note there is no shower. This second-floor room has a king-size bed and a seating area. There is free WiFi, an iPod docking station, a TV with a DVD player, chocolates and tea and coffee-making facilities. We have owned Bodnant Guest House since March 2014. It is a Victorian house but offers contemporary style throughout. House Rules Bodnant Guest House takes special requests – add in the next step! Bodnant Guest House accepts these cards and reserves the right to temporarily hold an amount prior to arrival. Please note the Bodnant Guest House cannot accommodate children under the age of 12. Everything was fine. No problems at all. No complaints about the stay at all. Nothing but you need to watch your feet walking past the single beds. If I am being really picky the only thing I could say is that the shower could have been more powerful.....but as I say that is being picky and overall it was fine. Shower pressure wasn’t particularly good. Lovely welcome, clean quiet room, comfortable beds, excellent breakfast. One point that’s could be looked at, which to to fair for the room we were in may be difficult is a mirror near a socket for doing Hair! That’s it though!